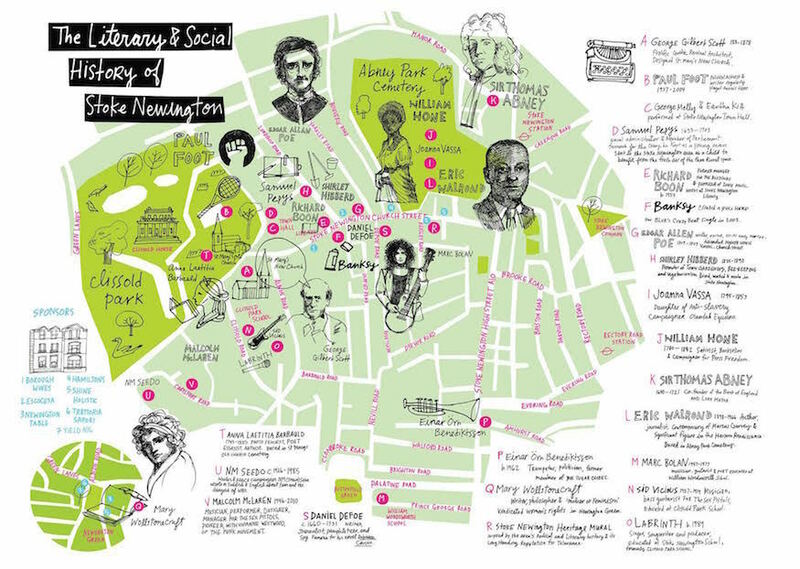 This map of Stoke Newington, depicting the literary and social history of the area, has been launched in time for this year's Stoke Newington Literary Festival. Every year the festival runs a pink plaque scheme, pointing out some more interesting parts of the area's history. The map and illustrated guide accompanies the pink plaques, letting visitors follow the trail to visit all of the plaques, or pick and choose which to see. Locations highlighted include the spot where Banksy created an artwork for the release of Blur single Crazy Beat in 2003, and the former house of Sir Thomas Abney, co-founder of the Bank of England. Architect George Gilbert Scott, diarist Samuel Pepys and musician Sid Vicious are among other famous Londoners featured on the 22-stop trail. The map is designed by White Wall Yellow Door, who have previously designed a ghost sign trail of Stoke Newington, and is available now in shops and venues around Stoke Newington.